With summer weather fast approaching on the east coast I decided it was time to get a new Battery Backup device (aka UPS) for my Mac Pro. This decision was hastened by my experience a couple of days ago when the power dropped during a thunderstorm and my Mac Pro—unable to communicate with my Tripp Lite UPS—dropped from lack of power. To my surprise I found through comments on my blog that OS X has built in UPS support, though just not with the older Tripp Lite I owned. I also got a few comments from folks on the blog and in e-mails recommending a couple of different Battery Backups and I did some more research on the topic. Though several vendors have products in this space APC seemed to consistently bubble to the top, both in end user ratings on sites like Newegg and with editorial reviews. I had owned APC units in the past and had very good luck with them. APC even has a great tool for determining which UPS class is best based on your power needs. Armed with this knowledge I decided that I really wanted a 1500VA / 865Watts class device. According to everything I read this gave me more than enough capacity to get through 5 to 10 minute long outages and continue to work, even while running the quad core Mac Pro with dual 20" LCDs. If the power went out while I was away then the APC would be able to tell the Mac when the batteries were in a low state and perform a graceful shutdown. The number of options from APC is staggering so once I determined the rating I wanted I looked for price points and availability. I targeted a $200 price point and found that my local Best Buy had the BX 1500 LCD in stock for $199. Newegg was a bit cheaper but when I added in shipping costs and the delay in getting it my local store was a better option. The BX 1500 LCD is a pretty large UPS, weighing in at a healthy 30 pounds. It has a bright red LCD up front that can cycle through some basic stats on the health of the device and even the power draw from devices attached to it. On the back are 6 battery backed outlets with surge protection and 2 that only offer surge protection. Two of the battery backed outlets are spaced in such a way that you can fit the larger adaptors favored by peripheral devices like cable modems and external hard drives. Lately my area has been experiencing some power fluctuations; this UPS has a technology called Automatic Voltage Regulation (AVR) that reportedly will help during those times. My UPS came out of the box fully charged; all I needed to do was open the case, connect up the leads for the battery and it was ready to go. It also came with a little "Data Port" connector and cable so that it could talk to the Mac Pro. This is a non-standard USB cable with normal USB connector on the computer side and an RJ45 connector on the UPS side. The downside to the BX1500LCD is that APC does not offer replacement batteries for it right now. The batteries are designed to last for about 3 years. I did a little hunting around and found an aftermarket vendor named Arizona Batteries that claims to sell replacement batteries for it. APC also has a trade-UPS program where you can turn in your existing APC UPS and get 35% off the retails price from them, though shipping on such a heavy item may be a factor. The only thing that was a little odd was that the indicator on the menu didn’t know how much time I had left on the battery, though it could tell me what percentage of charge I had remaining. If the power drops then the menu bar icon changes and then was able to tell me either what percentage of battery power was remaining or how much time I had left on the batteries. 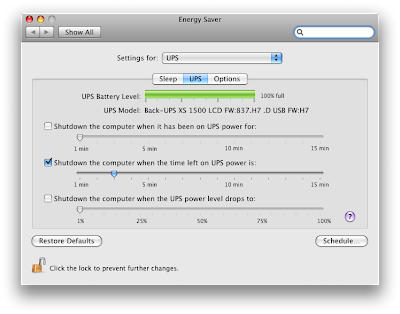 When I opened preferences I could now choose between settings for the Power Adaptor or UPS. Of the three settings the one that seemed most useful was shutting down when the time left on the UPS was X minutes; I set mine to 3 minutes, figuring that would be plenty of time to close everything up and leave a little room to spare, yet allow me to work for a bit if I wanted to keep going. APC actually ships some native OS X software with the system called PowerChute Personal Edition. It is a plugin that gets added to your preferences panel. I decided to try it out and see if it would add anything that I didn’t have with the native OS X features. It did not. I would not recommend installing it. A Battery Backup is really easy to test; just pull the plug on it and see what happens. First off, there is an audible alarm on the UPS and another on the Mac. The two fans on the UPS suddenly started running – something they don’t do when under regular power. A large warning window pops up on the Mac and tells you that you are now running on battery and to save your work. The indicator in the menu bar changes and now is able to tell how much power is left in the batteries as a percentage as well as how many minutes it thinks you have. Though there was no load on the machine it immediately dropped to 17 minutes of predicted run time. I didn’t push it too hard, putting it back on power after a few minutes. Even though it was only off power for about 2 minutes it took a full 15 minutes to recharge to full strength. A fully depleted battery should take about 16 hours to recharge. Though this is a rather long article for something as simple as a UPS it really was very easy to install and I’m really pleased that OS X was able to recognize it without having to install any additional software. If you plug your computer into a cheap little power strip today you should seriously consider getting even a minimalist UPS because of the surge protection it affords. Many thanks to the folks that commented on this blog and directly to me in e-mail about which UPS to go with.